Maruelli is an Italian company that specializes in research, development, patenting, prototyping and manufacturing of ski mountaineering products. They use the highest quality materials to ensure modified products are even more robust than they started. Maruelli is the Italian version of B&D, making useful aftermarket parts for tech bindings. They use the highest quality materials to ensure modified products are even more robust than they started. Find our growing list of Maruelli binding parts below..
A unique solution for uphilling on a splitboard with hardboots. Very light and stiff for good edging control on hard snow, the Maruelli Splitboard kit is a solid choice to get you up the mountain. 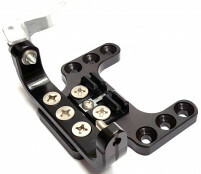 The kit consists of a set of toe pieces with a levering sc..